Fairway was conceived from dissatisfaction with existing methods for hull design and manipulation. Over the years thorough investigations of available design methods and their implementations in commercially available software have convinced SARC that the inherent shortcomings of existing techniques cannot be solved efficiently and elegantly. Rather than accepting and implementing fixes for the problems caused by these shortcomings (as has been tried in the majority of the commercially available software), SARC has developed Fairway. Either start a design by transforming a previously defined hull form, or start from scratch entirely. In the latter case, Fairway can generate a minimal set of lines for free-hand design. Designs can easily be modified during each design stage, even in the final stages. Match targets for displacement and LCB while transforming hull forms. Fair automatically with user-defined accuracy, up to and beyond production tolerances. 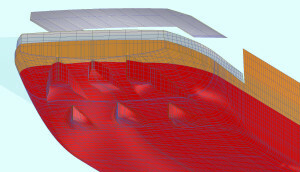 Generate shell plate expansions for double curved and developable surfaces. Adjust shapes to actual developable plates. Generate lines plans and tactile scale models (Rapid Prototyping, 3D printing). Simple hydrostatic analysis can be performed in Fairway directly, while complex analysis can easily be farmed out to PIAS. Define additional curves like frames, buttocks, waterlines, diagonals, lines in oblique planes, and free-hand threedimensional curved lines. Import hull form data from existing linesplans from paper drawings, drawing files, tables of offsets, et cetera. 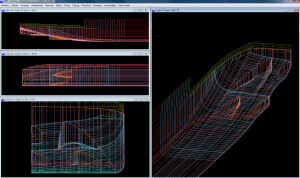 Export hull form data to AutoCad (DXF), MicroStation or Rhinoceros (IGES), NUPAS, VRML, Finite Element or Computational Fluid Dynamics software, et cetera. Reconstruct hull form data from photographs using photogrammetry. Fairway satisfies requirements of statutory regulations, quality assurance schemes and the ISM code. Fairway is accepted by all major classification societies and complies with Cat. B and C of ISO standard 16155 (Shipboard Loading Instruments). Fairway is being used daily by naval architects around the world. In The Netherlands, SARC is the market leader with its maritime software. At SARC, each employee is involved in both software development and design projects which utilize Fairway. New options are continuously developed, on request of users and when the need arises in-house. This ensures Fairway is always state of the art. In Fairway, newly developed techniques and methods have been combined with existing ones where useful, to yield a versatile and comprehensive tool for hull form design and manipulation. First we will discuss the merits of the ‘existing methods’ briefly, then we will introduce the Fairway approach to tackle the problems inherent to the ‘existing’ techniques. Some types of software use curve methods for hull representation and manipulation. 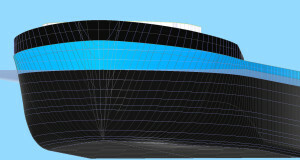 Examples are SIKOB/Seasafe, SFOLDS and some PIAS modules (definition of existing hull form and hull form transformation). The major advantage of curve methods is their suitability for the conversion of existing lines plans. 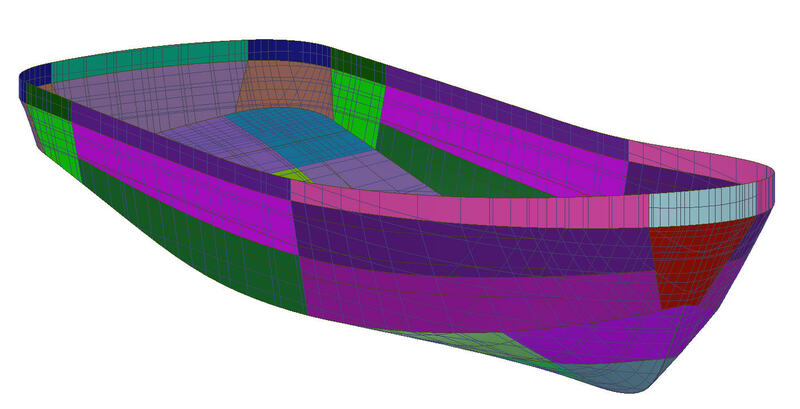 Curve methods define the hull surface implicitly, with curves running over the surface. In some systems the curves are represented by polynomials, whereas others apply B-spline curves or NURBS (Non Uniform Rational B-Spline) curves. The vast majority of contemporary general-purpose CAD systems, as well as specific naval architectural ship hull design software, apply B-spline or NURBS surfaces as surface representation. The most expressive characteristics of these surfaces are that they are clamped on a regular network of curves that cover the complete surface, and that they have four sides and four corners. Shape manipulation is performed by manipulation of points relating to the intersections of the defining curves. These points are commonly called vertices, control points, poles, knots, etc. There is one-way traffic on the road from surfaces to curves, for it is possible to derive specific curves from surfaces, but in general it is not possible to derive surfaces from an arbitrary combination of curves. Such an option is highly desired, whenever the surface is required to pass through specific curves such as waterlines or frames. The defining curves of B-spline surfaces in general do not run parallel to one of the three main planes of the vessel. Thus, the user must work with curves running more or less arbitrarily over the vessel’s surface. To model an existing hull design, or to work with great precision, the use of waterlines, ordinates, buttocks and diagonals is essential. To prove this, literature shows plenty of examples of objects rather similar to ships, but not real ships. The network of the surface method is too rigid. Each defining curve must cover the complete surface, so local refinements are impossible. Surface methods are suitable to design ships (hull form generation aspect), but because of the one way traffic from surfaces to curves it is impossible to start with an existing lines plan. Neither with curve methods, nor with surface methods, is it possible to fair a vessel up to production accuracy in an efficient way. Curve methods are unsuitable for fairing, because the coherence between the curves is not guaranteed, which makes the addition of extra curves cumbersome. Surface methods are unsuitable because they cannot cope with the naval architectural sense of fairing. Besides, the rigidity of the network, combined with the desire to model local features, leads to an unmanageable tight network when local refinements are taken into account. A system of surfaces is constructed, which without further topology support may be incoherent. The arrangement of surfaces is the responsibility of the ship designer. Continuity and discontinuity conditions between the surfaces have to be specified explicitly by the ship designer, and add additional rigidity. The insight in these properties of existing methods has been gradually developed during years of research at SARC. Other researchers have come to the same conclusions, as demonstrated by the paper Challenges in computer applications for ship and floating structure design and analysis in the Computer-Aided Design journal of 2012. In order to put things into perspective, SARC published an additional note in the same journal, titled A technical note on the geometric representation of a ship hull form. The development of Fairway has been led by the desire to produce a general computer tool for hull form definition, hull form generation and production fairing, where the mentioned disadvantages do not occur. For this purpose, SARC has developed a new type of model representation. The technical merits and potential of this new model representation is elaborated in the following sections. The basic modeling entity (that what the user manipulates) is the curve. Multiple curves can be connected to form a polycurve. The curve representation is a 3D NURBS. The shape of a curve can be manipulated by dragging the points that the curve passes through, by defining tangents, by manipulating vertices, by modifying properties of primitives such as the radius of a circular arc, and by defining geometric relations to other curves. Curves describing the hull surface are connected in a network through their intersection points. Contrary to B-spline surfaces this network is very flexible and may be highly irregular: it can consist of waterlines, buttocks, 3-D lines or any other curve the user desires. Curves of the network need not run over the entire hull surface, so they may be defined only in those regions where they are really necessary, for instance for local refinements. Individual curves are individually defined, with just the right amount of data to adopt the desired shape; there is no requirement that successive frames are defined with an equal number of vertices, for example. This aids fairing without compromising control and precision. Across the network a seamless surface is constructed by a method called transfinite interpolation, which closes the openings in the mesh with surface ‘patches’. These patches, which need not be quadrilateral, derive their shape from the curves that surround them. The resulting surface is used for visualization and interpolation of new polycurves. Surface patches connect with matching tangents, unless the patches share a curve designated by the user as chine. When new polycurves are interpolated, the user may specify whether the curves should match the existing surface at high precision, or just match the intersection with other curves, or anywhere in between based on the design stage, user preference, etc. Surfaces are curved in two directions, unless the user explicitly specifies regions to be developable. Coherence of points, curves and surfaces is automatically maintained with dedicated solid modeling techniques. Fairway offers support in working towards a user defined sectional area curve. The target area of frame sections can be compared to the actual area, both graphically and numerically. Frames can be shrunk or expanded to meet the target area, without exceeding preset width, raise of floor, etc. Hydrostatics for the design draft can be monitored continuously. Furthermore, because of the permanent link with other PIAS modules, also other hull form properties can be computed and visualized instantly. A curve can be set to the following types: curved (B-spline or NURBS), straight, or conic section (circular, parabolic or elliptical). The user can specify the nature of the connections between successive curves in a polycurve (fair, tangentially or knuckle). Doubly curved surfaces and developable surfaces can be mixed and plate expansions can be created, including templates. Manipulations can be done graphically and numerically, allowing excellent control over coordinates and shapes. B-spline curves can automatically be faired with a local scheme, where the user specifies a mean deviation between the original points and the faired curve. The user can also specify the relative weight of each individual point. The mean deviation is analogous to the stiffness of the physical spline (the smaller the deviation, the stiffer the spline), while the relative weight can be considered as a model for the weights of the so-called ducks. These fairing options allow complete control over the curves. This automatic fairing can be done to the satisfaction of the user: a model for preliminary stability calculations requires less accuracy than a model for production drawings and plate expansions. The degree of fairness can be checked by means of the curvature of curves, plotted perpendicularly to the curve. User defined sample lines can be projected onto the defined model, with user-defined parameters. Geometrical relations between curves can be defined, so one curve governs another, using factors and offsets. Being commenced in the 1990s, Fairway used to have a User Interface (UI) that allowed for graphical as well as alphanumerical operations, although the combination of the two was not as fluent as is possible with post-2K hardware and software. For that reason in the years 2010-2014 the UI was replaced with a newly designed GUI, which offers the following advantages. Commands and tables are presented based on context, and can be reorganized interactively, ensuring that only relevant information occupies valuable screen space. Minimized mouse-travel centimeters, in support of quick interaction and reducing muscle strain. Support for working in multiple views simultaneously, both in perspective and orthographic projections. Various methods for controlling zoom, pan and orientation tailored at efficient interaction, including support for the Space Navigator, a six degrees of freedom input device from 3Dconnexion. Curves and points under (or close to) the mouse cursor “light up” prior to selection. This so-called ‘pre-light’ removes any doubt on the effect of mouse clicks. Graphical manipulation happens by means of a custom-designed ‘dragger’, which is a threedimensional interactive object that can be clicked and dragged, giving clear feedback on translations. Functions for modeling are grouped by class into a small set of distinct ‘actions’. Each action has its own user interface panel and its own set of keyboard shortcuts. Typically, actions have three phases. In the prerequisite phase, for example, the user is asked to make a certain selection; this phase is skipped if prerequisites are already met. In the configuration phase the user makes changes, manipulations and edits; during this phase the previous state of the model is still visible transparently so the user can easily compare changes before-and-after. In the last phase the changes are either applied or canceled. Applied changes are recorded for the duration of the session, and can be undone and redone to compare the effect of successive actions, or to revert mistakes. The GUI is designed with a focus on continuous but subtle feedback, minimizing the need for disrupting pop-ups, warnings, training and support calls. The status bar shows the following information: the current coordinates whenever applicable, concise context-sensitive instructions for operation of the dragger, and the name, type and position of any pre-lit curve and the solid it is part of. If selection of a certain entity is not possible, then this is signaled with a different pre-light color and the reason is explained in the status bar. Tool-tips explain the meaning of menus, buttons and input fields. Shortcuts are drawn on top of controls whenever the context menu is up so the user can improve on efficiency effortlessly. Context-sensitive help is available in every action, which takes the user to the relevant section of the on-screen manual. Rendering of reflections to aid the visual assessment of the surface. Exploration of immersive virtual reality concepts. Integration of the import functionality for the conversion from a set of unconnected curves, and supporting unconnected curves as a modeling entity. These can then be used as construction lines and temporary markings, for projection purposes and for sketching an initial design that can be converted into a consistent network at a later stage. Manipulation of the tangential information across surface patches, for improved control over the surface. Support for shape variation over large areas. For input of existing hull models, Fairway accepts a wide range of input data formats, either directly or through pre-processing. Manual input of an existing hull form through PIAS hull form definition module, either from paper using a digitizer tablet, or from screen using bitmaps. Import of a hull form from a wire frame model in drawing file (DXF or IGES). Such a model can be converted into a solid model with a seamless surface, which is unique for commercially available software. Choosing a hull form from the library of over thirty parent forms. Transforming this parent to a desired daughter form, by scaling and transformation, provide a very quick design start. A unique option is reconstruction of a hull form through photogrammetry. Using a range of overlapping photographs and some additional data, a complete or partial hull form can be reconstructed for further manipulation. Both surface and line entities can be exported, for example for import in AutoCAD (DXF), Rhinoceros or MicroStation (IGES), NUPAS, Finite Element Analysis or Computational Fluid Dynamics software. Other CAD/CAE software can draw sections from a Fairway hull model in client/server fashion: the software ‘asks’ for a hull line and the hull server responds with the desired line geometry, generated on-the-fly if required. Lines plans on paper or in offset tables. Plots, DXF files and coordinate tables of plate expansions, including tables of distortion. Tactile scale models (Rapid Prototyping and 3D printing). Rendered graphics of hull models, both integrated in the GUI as well as for presentation purposes. Fairway is designed for the Windows platform, requiring Windows Vista/7/8 or 10 to function properly. Fairway, like PIAS, is delivered complete with installation, training, operation instruction manual and SARC can provide for the approval by classification society. Through a password-protected section on our website the latest version of the software and manuals are always available for download. Please contact us for further information.